I come from a family that visits the graves of our loved ones on Memorial Day, birthdays, anniversaries, whenever we can. My first memory of going to the cemetery was in the late summer of 1956. My grandfather had died in early July and his headstone had been set in Holy Cross Cemetery in Butte, Montana. It was a was a "companion" grave marker with a place for my grandmother's name, which would be blank, waiting for her for 20 years . Years later when my brother was killed in an accident at age 16, the family purchased a plot at Ivy Lawn Cemetery in Ventura, California. He was buried alongside his best friend, who had been driving when the train hit their van at a railroad crossing at La Conchita on Highway 101. How many times did we bring flowers for both of them, weeping and praying silently? The plot filled up. My mother died seven years later, and my father's brother, a few years after that. More visits, more flowers, more tears. Our private grief and private memories. As often as I had visited the graves of my family, nothing prepared me for sight of the Mexican families readying their plots to celebrate the Dia de los Muertos, the Day of the Dead, in San Miquel de Allende. My husband and I were there as part of a workshop where for two days, All Saints and All Souls, we observed and photographed in the cemetery where people remembered the deceased, honoring their memories with labors of love. Like my own family, each person holds a separate memory, yet across the site there was a sense of collective memory in a culture that repeats this ritual year after year. Entire families approach the graves, their arms overflowing with flowers: roses, chrysanthemums, cockscomb, marigolds, marigolds and more marigolds—the flower of the dead. 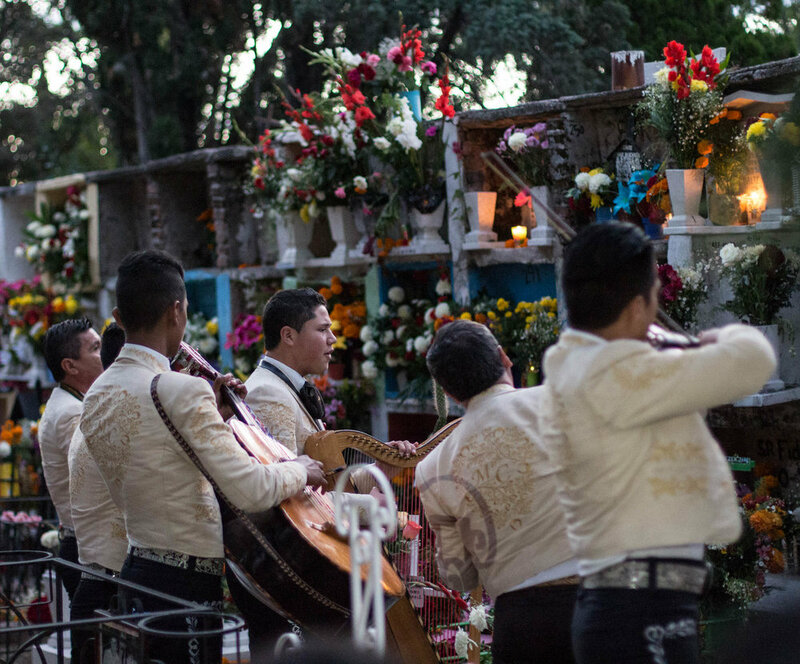 As they rebuild the humble graves and decorate them with the flowers, toys for the lost children, tequila, and favorite foods, there is music and dancing, as well as a Mass. Re-engaging with the memory of their loved ones, the sadness of the lost life is mitigated by the joy of its celebration. The power of that collective action reinforces memory in the Mexican families that gather—memories of a shared history, of the syncretism of Hispanic memory and indigenous memory revealed in the dozens of crosses and Virgins throughout the cemetery and the marigolds—cempasuchil in Nauhatl— spread across the graves. Back home, visiting our well-tended graves in "perpetual care", the power of the collective is missing. We are alone in our loss, fearful of death. Perhaps, that is changing as we learn from our Mexican neighbors, both south of the border and next door. Recently Los Angeles Times reporter, Esmeralda Bermudez, spoke with a group of Catholic School children gathered at Calvary Cemetery in East LA to celebrate the Day of the Dead by building altars for loved one who have died. Learning to honor family and culture in this way, they may be able to teach us.